This section is for things directly for sale on this site. 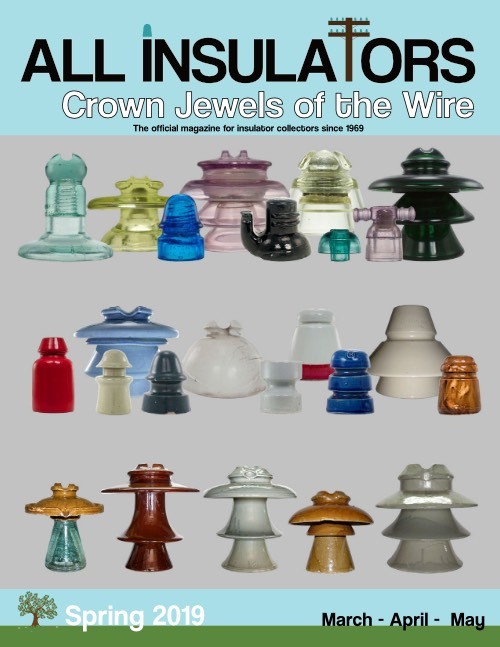 Including All Insulators - Crown Jewels of the Wire Magazine. Below you will find examples of insulator related T-Shirts, coffee mugs, beverage glasses and more. The designs are from old (out of copyright) ads (and patents) for insulators. The ads have been colorized to add some pop! I plan on creating some original designs too. If you have ideas of an insulator related item you would love to see, contact me and I will see what I can do. All items are available for purchase on All Insulators Cafe Press page. On the Cafe Press page you can see a sample of the items available along with pricing and can buy directly from the online store. Designs available on T-shirts, coffee mugs, drinking glasses, calendars posters and notebooks. Vintage ad for Brookfield Glass company manufactures of glass insulators. Ad has been colorized with a purple and green insulator. Vintage catalog page for Brookfield Glass Company. This is of an "O'Brien's patent" CD 119 insulator. Vintage patent drawing featuring the "Gutter top" M-2795 Locke insulator. Patent drawing has been colorize to look like the actual insulator. Vintage ad for Hemingray Glass Company. With four insulators with "Standard" ad slogan. Vintage ad that was colorized featuring Hemingray Glass Company. "Specify Hemingray" slogan on ad. Products featuring vintage Hemingray ad with the saying "See the teats on the petticoat".